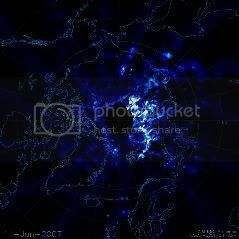 Noctilucent clouds (NLC) form in the arctic mesosphere (~80-110 km altitude) in the summer. As the name implies, these clouds are seen at night. Shortly after sunset, the sky is black because the lower atmosphere is in the earth's shadow but the upper atmosphere is still illuminated. Thus these clouds are often seen against a starry background. They occur in the summer at about 85 km altitude because the rising arctic air is strongly cooled by expansion, and is in fact colder than in the winter (~120 K rather than ~240 K). The cloud particles are ice. This is inferred from their forming in conditions where the water vapor would be supersaturated. The altitude of these clouds puts them in the ionosphere where there are free electrons created by solar wind particles, and during the daytime, UV irradiation. The electrons can attach to the ice particles thus creating a "dusty" plasma. There is also thought to be meteor dust in the ionosphere. These particles can also become charged and may act as the nucleation centers for the NLC particles. Meteoric dust particles in the mesosphere have never been detected in situ and are only known from models. The surprise is plasma vortices, huge whirls of magnetized gas as wide as Earth itself, spinning on the verge of the quaking magnetic field. "When plasma jets hit the inner magnetosphere, vortices with opposite sense of rotation appear and reappear on either side of the plasma jet," explains Rumi Nakamura of the Space Research Institute in Austria, a co-author of the study. "We believe the vortices can generate substantial electrical currents in the near-Earth environment." ...if birkeland currents in pairs rotate in opposite directions ? MattEU wrote: my mate emailed me this report Plasmabomben lösen Weltraumbeben aus (Plasma bombs create Galaxy Earthquakes) and its the only thing i can find. the problem is that its in german and it looks to be either brand new or not reported on yet. that english title seems to be correct although it might have lost a little in translation. The plasma bomb time and again thrown back into space, says Baumjohann: First, with about a thousand kilometers per hour, then at half speed, then with 360 km / h. "The measurement curve is similar to the seismogram of earthquake," says the researcher. "That really surprised us." The energy released by both natural phenomena is comparable, says Rumi Nakamura of the Academy. However: "A Space earthquake extends over a much larger area, the energy is distributed accordingly." A spacecraft that fly through the affected area could, according to the cosmic vibrations Baumjohann but quite dangerous. "In fact, Earth can actually stimulate asteroidquakes when wayward space rocks fly too close to our planet." Brilliant! We speculated a few months ago about asteroid and meteoor colors and also about asteroid quakes. Again, the EU is the way forward in my little view. I saw this article about some aurora associated with our recent CME. This picture shows an odd "figure" in the top right corner (circled). The explanation was a satellite being impacted by the magnetic storm. But will charged plasma flow into a... i hate to say it.... bow shock-like appearance when encountering something like a satellite? Wouldn't the plasma encase the sat in a cell? Does not the "figure" bear some resemblance to a plasma instability? I look forward to reading this discussion! Last edited by Speed Metal on Tue Aug 03, 2010 5:44 am, edited 2 times in total. Looks like an elve+sprite to me. Sprites, Blue Jets, Elves and "Superbolts"
it does look like the shape of a sprite/elve. are they meant to be formed only when there is an electrical discharge going upwards or downwards? is there any other EU thing that shape that might fit in with whats going on in an aurora? I think the shape of upper atmospheric jets, elves and sprites has to do charge distribution as a function of the atmospheric particle density/temperature layering, and not so much if anything to do with direction of plasma travel. Any one have some evidence/measurements regarding plasma flow characteristics in aurora to elucidate this? On a related question, do boreal and australial auroral flows both move downward, both upward, or is one going "down" and the other "up" wrt the surface of the earth, and has this been conclusively measured? My thanks to people here, by the way, for originally pointing these pictures out to me a long time ago. That's exactly one of the pics (That's the Crab Nebula pulsar isn't it?) that popped into my head when I saw this aurora pic. That and Perratt's instabilities. The sprite/elf/blue jet idea is also intriguing. Have they been spotted in clear skies before? I always thought that they were associated with thunderstorms and cloud tops? Also, aren't these types of lightning very large and very brief? If it indeed was one of the sprites or elves than it must be one of those rare lucky snaps. That first picture I posted is of the Vela Pulsar. Don't worry, I initially thought it was the Crab Pulsar as well, and only found out otherwise when trying to source the picture. I agree with you guys- in my opinion it's a pinch with a torus. The question is- what is a pinch and a torus doing in a plasma sheet like that? Is it possible that the perspective is way off on the shot, and what is seen is actually some distance beyond the region of the plasma sheets of the aurora itself?